The opening scenes of ‘The Maltese Falcon’, (1941): The film makers identified the location, but most people wouldn’t have much trouble recognizing where the action will take place from this shot. Below, is a YouTube link to the opening scenes of the movie. Kelly Sherwood, (Lee Remick) must call “Red” Lynch, (Ross Martin) from a phone booth in Fisherman’s Wharf to find out where to deliver ransom money to free her kidnapped sister, Toby Sherwood, (Stefanie Powers)in the 1962 film, ‘Experiment in Terror’. Obviously, she doesn’t have a nickel, or maybe it was a dime by then. Behind her is the Fishermen’s Grotto #9 Restaurant. I’ve posted the YouTube link below before on my blog, but I enjoy watching it. 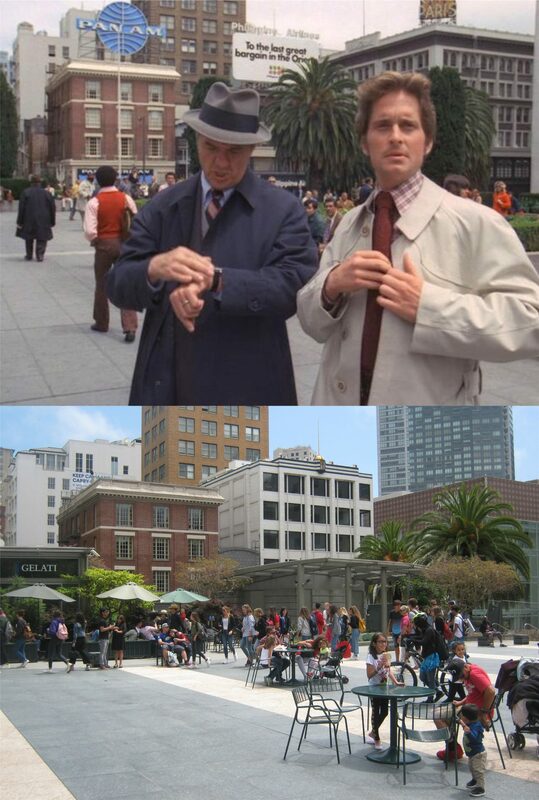 It’s a neat recap of one of my favorite San Francisco movies packaged into the Henry Mancini theme from the opening credits. Elaine Robinson, (Katherine Ross) didn’t, actually, say that last line to Benjamin Braddock, (Dustin Hoffman) in the 1967 film ‘The Graduate’, but she should have. They were at Monkey Island in the San Francisco Zoo, then known as Fleishhacker’s Zoo. Benjamin, obviously, needs the Google Maps App. Even the monkeys aren’t too sure about this guy! The link below is the YouTube video to the theatrical trailer for the film, although, the zoo scene isn’t shown. She, obviously, has something on her mind! Below, is a YouTube link of the scene. A YouTube link below to a colorized version, (The film was shot in black and white) of the giant octopus destroying the Golden Gate Bridge in the 1955 move ‘It Came from Beneath the Sea’: Obviously, this was not a good day to take a drive to Marin.